When Laura Lamontagne first got to Concordia University, she did not want to play on the soccer team. After excelling at the AA and AAA levels in high school and then in Division 2 for Collège Bois-de-Boulogne, she decided to focus on her education. “In my first year [at Concordia], I did not play because I was scared a bit with school. I did not know how university was, so I was a bit anxious,” said Lamontagne. After a year of settling into school as an exercise science student, Lamontagne said she felt she was ready to take on the challenge of being a student-athlete, and has since adapted to the taxing lifestyle. Lamontagne would not be playing for Concordia University, or possibly even soccer for that matter, if it had not been for some inspirational people in her life, such as her family and other professional players. Her mother coached her as a young player, but as a Concordia alumna herself, Lamontagne’s mother suggested that she play for the school, and play with pride. Other inspirations to Lamontagne are American soccer stars Alex Morgan and Abby Wambach. Both are Olympic and FIFA World Cup winners with the U.S. women’s national team and are ambassadors to women’s soccer. The Canadian women’s national team is also starting to be an inspiration to young girls across the nation. The women now hold back-to-back bronze medal titles at the Olympics, and after beating Brazil 2-1 in the bronze-medal match at the Rio Olympics, they became the only country to repeat a podium appearance in women’s socccer in 2012 and 2016. For Lamontagne, this was important for the game in Canada. Laura Lamontagne scored four goals with the Stingers last year. Photo by Nicholas Di Giovanni. Shortly after the triumph in Rio, national team player Rhian Wilkinson met with the Stingers. Lamontagne said that it was a cool experience to meet the veteran Wilkinson, a Montreal native herself. Lamontagne certainly has fed off the energy from her inspirations during her time on the soccer team. Last season, she scored four goals as a rookie. She also scored the team’s opening goal of this season in their game against the McGill Martlets on Labour Day weekend. As a left winger, Lamontagne uses her speed to cover ground on the pitch, both offensively and defensively. She has the ability to create chances on the flanks when given time and space, and is an aggressive player with a never-back-down attitude. Despite her talent of blowing past fullbacks on speed alone, Lamontagne knows there are always areas that need improvement. Dribbling is one of them. “When I’m one-on-one, I have the speed to run in the space, but I need to find the speed with the ball to be able to clear a player on the sideline,” Lamontagne said. 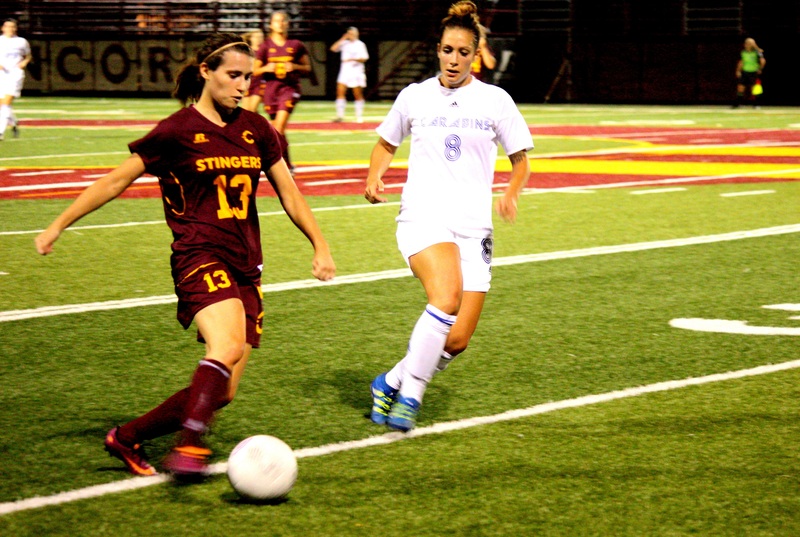 As for her team, the Stingers have been improving steadily over the past few seasons. The Stingers finished the 2014 season with a record 3-6-5 and slightly improved their record last season of 4-9-1, which meant finishing sixth in the Réseau du sport étudiant du Québec (RSEQ), just missing the playoffs. Even though the Stingers have not made the playoffs since 2009, Lamontagne feels she plays on a team capable of doing some damage in the conference this season. “I think we are going to accomplish a lot of stuff. We have some really good players, we have a very big potential, and it’s a really good team,” Lamontagne said. She also added that this team is one of the best she’s been on. “We’re a very hard working team—we always push, we work hard, we have a very good team spirit, and you can tell we have a team fighting to win every game,” Lamontagne added. Lamontagne and her teammates will be taking on the Université de Québec à Trois-Rivières in their next game, on Sept. 16 at 8:30 p.m.